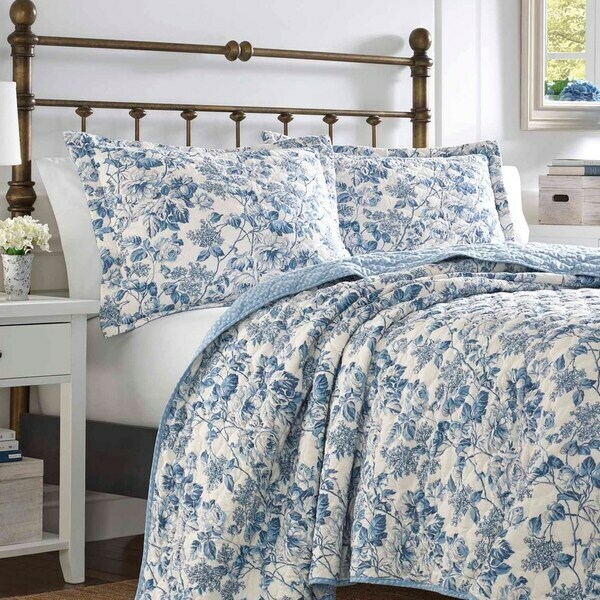 Showcasing a beautiful floral pattern, the Aimee Delft Quilt Set from Laura Ashley brings a nature-inspired touch to your bedroom decor. With its cozy cotton construction, this lovely set is the perfect mix of style and comfort. This is a beautiful bedspread. The colors are exactly as pictured and it's true to size. The pillow shams are a little larger than the usual sized shams. I will need to purchase some larger pillows to fill them up. The quilt is light weight and thin, which is what we preferred. We added an extra blanket for the winter months and will take that off during the summer months. This set is gorgeous! Love the blues in it! True to size and a good weight. Love the color. Happy with the price!